We actually watched SNL the other night when the F word was slipped. We kept rewinding the DVR just to make sure we’d actually heard it and yes, there it was on the news section of Comcast today. We weren’t imagining things at all. By the way, if you live in the Los Angeles area (and some of my friends who read this blog do) and are looking for a Los Angeles Moving Company, then you should check this place out. Melrose Moving Company is committed to affordable, reliable and professional service in a Moving Company Los Angeles style. Customer service is their #1 priority! So check them out for Movers Los Angeles style and see what they have to offer for you. Supposedly it’s supposed to get chilly the next few nights but I’ll believe it when I see it since it was supposed to be in the 60’s tonight. Right now it’s 2:30 am and it’s still 77 outside so that sure didn’t happen. I’m so proud of myself. I got a B on my test in Juvenile Justice. This is an awesome teacher but I never do well on his tests and this is my third class with him. I always make a C or lower on the tests even though I always pass his classes. I wonder if it’s the Acai I’m taking. LOL Seriously, everything on the test just came to me while taking it, which never happens in there. I’m sure not complaining. Now let’s see if I do that well on the Probation and Parole test I have on Thursday. I had some burgers delivered from Schwan’s today. They were free to try out the service and they delivered them to the door, no charge. They left a catalog and some of the food is quite inexpensive. He told us he’d be around till about 8:30 pm if we wanted anything else and lo and behold they have the stuffed potatoes with cheese. He came back and we got a couple of pizzas and those. It was neat because he wanted to meet our dogs and spent a lot of time playing with the twins. I thought that was cool. I finally picked up my pre-order of Dan Brown's The Lost Symbol. So far it's pretty good. I thought it was neat that they had a phone number in there that really took you to a voice mail instead of the usual 555 numbers. Anyway, I'm reading that and The Strain by Guillermo Del Toro. Both are great and it's a nice change to be reading books lately that are good instead of the patch I went through where I kept getting books that weren't so great at all. Check them out! Did you know that a recent survey of more than 500 human resource professionals that 84% of them agree that well-groomed employees advance the corporate ladder than employees that are not well-groomed? In fact, they even prefer well-groomed employees to a firm handshake. Gillette recently launched Gillette Career Advantage where you can go and get expert advice from Mark Jeffries, who is a career expert, and Brett Fahlgren, who is a GQ style correspondent. Not only that, but you can go there whether you’re looking for a job or already have a job and need advice on career advancement. You can visit the site to take the Gillette Career Quiz and/or read through the hire guide to see what employers really think about certain things. If you’re looking for information on Gillette products or just want review survey results and get advice from grooming and career experts just visit the Gillette Resource Center . It’s never a bad thing to have the most information you can about furthering your career or help with landing that perfect job. The Gillette Career Advantage network is an excellent resource and best of all, it’s free for you to use. Why not check it out and help yourself get ahead in the workplace? Charter has been giving away some sweet prizes lately. Most recently it was a laptop a day! But now they’ve outdone themselves with the Camaro Sweepstakes where you can win one of the highly sought after Camaros. The Camaro 2SS is gorgeous and I’d love one for myself. The contest is from September 15th through November 26th at noon. Not only are they having this awesome contest but you can get a $100 gift card if you get three charter services, $50 for 2 Charter services and even a $25 gift card for just getting one Charter service. These gift cards are from major retailers where you can get clothing, home furnishings and restaurants. You can’t go wrong with a gift card! Charter believes in fast service and the new 426 hp Camaro is the epitome of what they represent. This car is one of the hardest to find in North America and they are giving it away for nothing! Imagine getting this car for free; think of how exciting that would be. Just visit Charter and check out the rules and don’t forget that you can follow Charter on Facebook and follow Charter on Twitter as well. Don’t let this contest pass you by, you might just drive away with the new Camaro! I was recently able to try SlimShots to see what this product was all about. SlimShots comes in individual little containers so they're easy to take anywhere. I tried one at breakfast and lunch and it did seem to help curb my appetite so I'll keep using it. Each pod has 20 calories and can be refrigerated to enhance the flavor, which comes in vanilla and chocolate. A one month supply will run about $55 plus shipping but they do have a special where you buy one month and get one month free. I thought it was very handy and did seem to help. It's also mostly all natural. The main ingredients are natural and only artificial vanilla and sweetener is added to add flavor. They also don't have any stimulants so there's no worry in making you jittery. 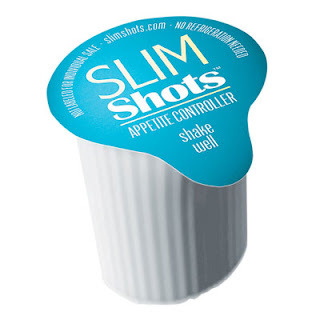 SlimShots can be taken as a shot or added to coffee, yogurt, cereal or shakes. I can't figure out why I like this show. It's not the type of show I'd like and I should think it's pretentious and hate it. With that said, I can't stop watching it and I really like it. Nothing too exciting happens usually (cause tonight it sure did) and it's not like it's heavy drama but there's just something about it I love. Now tonight something did happen. I won't spoil it but it involves an office party, a riding lawnmower and a mowed down foot. It was totally unexpected and awesome. So, if anyone can figure out why I like this show let me know. The other day I thought I really needed ShopWiki for a new Xbox 360. First of all, ShopWiki is really cool because where most search engines put ads up of places that have paid them to do so, ShopWiki doesn't work that way. They find every store online by crawling the pages like Google. This way you get better savings, not just a site that paid to have you see their ad. So we've been having these huge storms the last few days. On Monday we were watching Season 4 of Criminal Minds. I should say "re-watching" because I never miss a show. So the disc is in the Xbox 360 when the power goes out and we get (gasp) the Xbox red ring of death. This is a red light that shows up and usually means your Xbox is toast. Fortunately we were able to restart the Xbox and lo and behold, the red ring of death went away and all was good in the world. Now we can just find new Xbox 360 games and Xbox 360 accessories instead of having to purchase a whole new system. Looking forward to the new season of America's Next Top Model, even if Tyra is crazy as heck. I heard they're going to show the stampede that happened during casting. I think that casting location seriously needed some major crowd control. If they'd had barricades, stanchions or heck, even a velvet rope (okay so it's a casting not some kind of high end club) they might have avoided that fiasco. Either way, it's a fun way to spend a mindless hour and it's a blast picking out the bitchy girls. Plus, who doesn't love Miss Jay? At least this year it fits into my schedule. Last year was a huge disappointment in having to watch it on Friday nights instead of Wednesday and losing a show to boot. Now my only problem is Thurs nights and I believe Wed has another issue but not during that time slot. Been working on a new site that's almost done but not quite. I haven't done the marketing yet and there's a few more things I have to do but it's been started and you can see it here. I have another I'm starting soon and one that I'm not sure of but at least I'm staying somewhat busy. In this current economy you might not be able to party like a rock star or celebrity but there is one thing you can do. You can live vicariously through Rehab, the most happening party anywhere and in the infamous Sin City, Las Vegas. There are celebrity performances and parties for you to enjoy but there’s also the real drama behind the scenes. New staff must learn how to do their job the right way, there’s more pressure for sales to be higher due to the economy and competition for surrounding pool parties and hotels. What makes it fun is that you can watch it all on truTV's Rehab. You get to not only watch the beautiful, tanned bodies have fun but you get the real life drama of the people that work at the party as well. Now I’m sure you all have been to some pretty wild parties but this tops them all and best of all, you get a front row seat. Right now they even have a sweepstakes you can enter for a chance to party like a rock star at Rehab at the Las Vegas Hard Rock Hotel and Casino Pool. Now wouldn’t that be a blast? Just visit www.getrehabready.com/index.html#link to sign up. Got two great deals today at the same place. We went to World Market looking for some spices and I got a bottle of Marilyn Merlot I didn't have. It's the 2007 bottle. So far I have 5 bottles but they run from 1985 up to 2008. The older ones are super expensive, one was $5000 per bottle. I guess they definitely go up in price. Since I just collect, it's a great bottle for my collection. 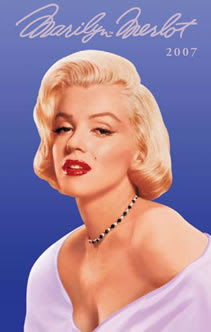 Right now I have three Marilyn Merlots and two Norma Jean Young Merlots. I also got Witches Brew because I like to collect any with animals or Halloween type stuff. (like Vampire Wine, which I have). 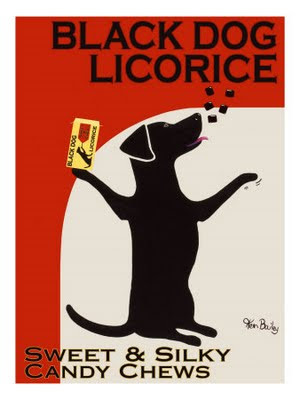 I also got the Black Dog Licorice framed print by Ken Baily. It was normally $99 and got it for $25 because the glass in the frame was broke. We got another glass and now it can go in the dining room which has a lot of red in it. Why do the networks have to put the shows I love on at the same time? Does anyone have an onDemand lineup? On Wednesday nights at the same time I have Criminal Minds, Glee and Law & Order: SVU. I know Criminal Minds isn't onDemand but I'm not sure about the other two that I really want to see. We had this issue last year with Lost and now this. I'll have to figure it out somehow. Wow, imagine if I did all that and the neat thing is that there’s no separate tower. Maybe she might consider replacing me since HP has an awesome coupon right now where you get $30 off orders $150 or greater at HP Home Store using coupon code SV2132. Valid through 10/31 or while supplies last. Restrictions and exclusions apply. I might just have to drop her a hint. We added sausage, canadian bacon, pepperoni, mushrooms, onions, basil, oregano. Whatever you want to add. Just spread your dough in the pan (we had to buy pans) and make sure it covers the sides. Add the cheese to the bottom of the pan and use half. Add your fixings, put the tomatoes on, add the rest of the cheese and bake about 15 minutes or so, until your crust is golden brown. Today I had a facial appointment but they had double booked so I got my pedicure instead. I have bright pink toenails and smooth and silky feet now. I love it. Not much beats a foot massage, foot bath and hot towels. I am also starting on their site. I'm going to enjoy it since she gave me free reign pretty much. So far, at least. R is off tomorrow so we may check out the new Indian restaurant. They have a pretty awesome lunch buffet I hear and I can't wait. I love Indian food. I have now seen two Tyler Perry movies and have loved them both. Tonight we watched The Family that Preys and it was awesome. I plan on renting most of his stuff. There are three packages you may be interested in: the stimulus package, the in-season pass or the full-season pass. Each package has different benefits and you can also sign up for free with the stimulus package or get a free trial on the full-season pass that allows you the intelligent draft software. The usual prices range from $19.99 to $99.99 but now the highest cost is only $29.99 and the lowest is free! I really liked checking out the teams and how you can browse them by divisions so it’s easy to find your favorite. Once you choose a team you can view statistics by rushing, passing, first downs, etc…everything you need to know to build your fantasy team. As you can see, I pulled up the New Orleans Saints and was able to compare them to other teams. Check it out, you’ll love the site.